Vivacious. Elegant, friendly, unpretentious, modest, abhors the vulgar, classy, imaginative, and creates a calm atmosphere. As its name suggests, the river birch naturally grows along river banks. But as a landscape tree, it can be planted almost anywhere in the U.S. The species is valued for its relatively rapid growth, tolerance of wetness and some drought, unique curling bark, spreading limbs and relative resistance to birch borer. The river birch has not yet reached the popularity of many maples and oaks, but it is well on its way. In 2002, one of its cultivars was even named the Urban Tree of the Year by the Society of Municipal Arborists. Features glossy green leaves that are 2–3″ long and somewhat triangular. Margins are double-toothed and leaves are arranged alternately. Produces brown and green catkins in April and May. Yields a large number of tiny nutlets after female catkins mature, typically in May and June. Develops a cinnamon-colored bark that curls and peels (once mature). Can grow as either a single- or multi-stemmed tree. Is the most borer-resistant birch. Works well for holding stream banks and keeping erosion in check. Should not be planted in very alkaline soil. 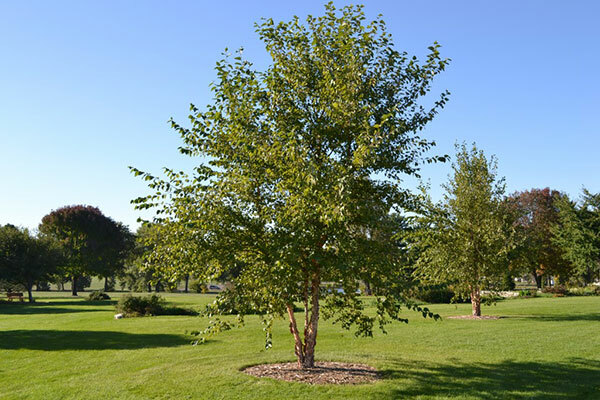 The river birch can be expected to grow in Hardiness Zones 4–9. The river birch grows to a height of 40–70′ and a spread of 40–60′ at maturity. This tree grows at a medium to fast rate, with height increases of anywhere from 13″ to more than 24″ per year. Click here to see our full selection of trees and plants that you can memorialize your loved one with. The Eternity Kit with Tree or Plant is a uniquely compassionate way to honor your loved one. Their cremated essence, irrespective when they passed, will nourish a baby-tree or baby-plant into a glorious representation of your love. You can now give new meaning and life to your loved one and choose a tree or a plant that best represents their memory or personality. Whether they were cute and quirky or calm and steadfast, there is a tree or a plant that will exemplify these characteristics. Click here to choose a tree or plant that best exemplifies your loved one. 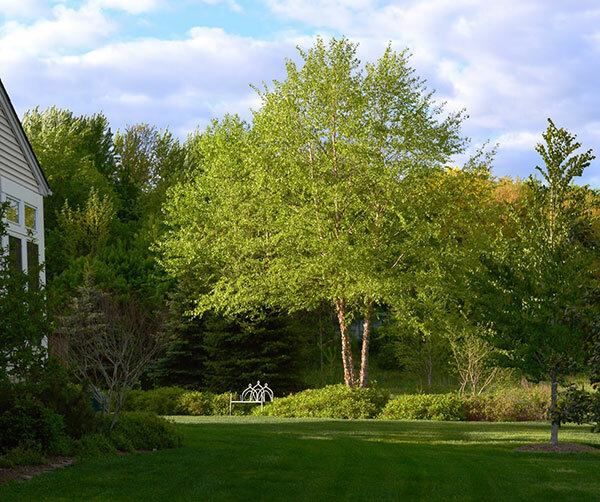 We have two categories of trees: Year-Round Baby Trees (Pine, Spruce, and Cypress) and Seasonal Baby Trees (Oak, Maple, Birch, Ash, Poplar, Cherry, Dogwood, Willow, and many more). The Year-Round trees can be shipped and planted throughout the year while the Seasonal trees will ship in their prime planting season. Our plant choices are ideal for internal environments. They are very portable and equally meaningful as a baby-tree. Once you order and receive this Eternity Kit you will combine the cremated essence of your loved one and a proprietary soil mix into an organic capsule. Your eternity baby-tree or baby-plant will then be planted and eventually nourished by your loved one’s cremated essence. Your loved one will give birth to new life. The Eternity Kit with a Tree or Plant is uniquely compassionate way to honor your loved one. Whether your loved one recently passed away or five years ago, you can give them new meaning in a memorial they deserve. With your purchase you will receive a complete system that will enable you to plant the cremated essence of your loved one along side a hand-selected tree or plant. Your loved one’s essence will nourish the tree or plant as it grows into a glorious representation of your love. Your loved one will give birth to new life. The kit consists of a bamboo cylinder keepsake, an organic capsule, ash neutralizing mix, premium growth mix, aged wood chips, and a voucher to claim your carefully selected tree or plant. —> Click here to pick a tree or plant that best represents your loved one. * Please note that the tree or plant is included in the purchase price, but will be shipped separately to ensure optimal growth. You will receive a voucher to claim your tree or plant when you are ready for planting. This company was born from our own experiences and needs. We truly felt that we could not be the only ones that wanted to honor the lives of our loved ones in ways that best fit their personalities. While grieving, we wanted an easy and transparent way to purchase the products and services we desired to memorialize our recently deceased. Surprisingly, this was difficult to find. Traditional funeral homes kept trying to sell us products we did not want and did not offer what we needed. Some even smirked when we were seeking services for our deceased animal companions. We value all life and believe honoring our deceased is the ultimate final expression of love that we can offer. This is why Full Circle was created. Full Circle is the company I needed when my best friend Bonnie passed away. I will never forget their professionalism, understanding, and passion to help me through this dark time. They gave me ideas on how to celebrate the life of Bonnie, and I finally settled on their baby tree memorial. I can now look out through my window every day and see Bonnie’s final resting place and the new baby tree she is giving life to. Thank you Full Circle.